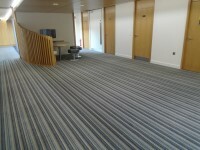 Fourth Floor - School Offices (including Head of School office: 4.01), Academic Staff for: Asian Studies; Celtic & Scottish Studies; Translation Studies; Film Studies; Film in the Public Space, Postgraduate Computing Labs. 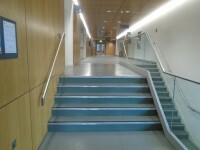 To view the DisabledGo access guide for Lecture Theatre G.03 please click here (new tab). 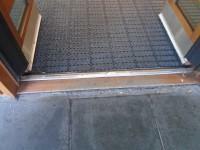 To view the DisabledGo access guide for G.01 please click here (new tab). 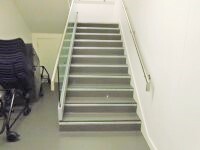 To view the DisabledGo access guide for G.02 please click here (new tab). 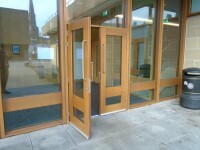 To view the DisabledGo access guide for G.05 please click here (new tab). To view the DisabledGo access guide for G.06 please click here (new tab). To view the DisabledGo access guide for Project Room 1.06 please click here (new tab). To view the DisabledGo access guide for 2.13 please click here (new tab). To view the DisabledGo access guide for 2.14 please click here (new tab). To view the DisabledGo access guide for 2.29 please click here (new tab). To view the DisabledGo access guide for 2.30 please click here (new tab). To view the DisabledGo access guide for 1.01 Computer Lab 1 please click here (new tab). To view the DisabledGo access guide for 1.02 Computer Lab 2 please click here (new tab). To view the DisabledGo access guide for G.04 Screening Room please click here (new tab). To view the DisabledGo access guide for 2.39 please click here (new tab). To view the DisabledGo access guide for 2.54 please click here (new tab). To view the DisabledGo access guide for 3.03 please click here (new tab). To view the DisabledGo access guide for 3.13 please click here (new tab). To view the DisabledGo access guide for 3.14 please click here (new tab). To view the DisabledGo access guide for 3.29 please click here (new tab). To view the DisabledGo access guide for 3.30 please click here (new tab). To view the DisabledGo access guide for 3.39 please click here (new tab). To view the DisabledGo access guide for 3.54 please click here (new tab). The Central Area is located on the south side in the city centre. Traffic congestion can be a problem, and parking is strictly controlled. A number of University car parks are located in the Central Area. 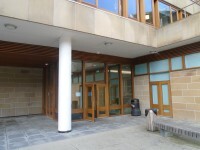 The Transport and Parking Office of the University of Edinburgh manages parking at the University. 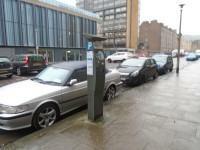 University car parks are for the use of permit holders only, and are subject to the university’s parking regulations. Permits are available for visitors to the university. Buses from all over the city travel to the Central Area of the university. 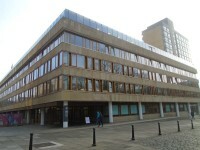 The University also provides a shuttle bus for staff and students between the Central Area and the King's Buildings. The majority of buses are operated by Lothian Buses. Up to the minute "real time" bus timetable information is now available at the majority of bus stops across the city. Information panels provided next to the majority of bus stops let you know when the next bus services will be arriving, or if there has been a delay. The Central Area of the university is 0.7 miles from Edinburgh Waverley Station. It should be noted that some of the walking routes may feature paths with steep gradients or steps given the landscape. Edinburgh has rail links throughout the UK. The East Coast mainline, which links Edinburgh and London King’s Cross, is the UK's fastest intercity railway: you can travel between the cities in around 4 hours. Or, if you prefer to travel overnight, a sleeper service runs between London Euston and Edinburgh Waverley 6 nights a week. There are great links to other cities too. The journey to Glasgow only takes 45 minutes, while York, Newcastle or Aberdeen can be reached in about 2 hours. All trains arrive at Waverley Station in the centre of the city, although some trains also stop at Haymarket, which is a smaller station in the West End. To see the university's webpage for travel and parking information for the Central Area please use this link. To view the National Rail Enquiries website please use this link. To view campus maps please use this link. To see more information on The Advice Place please click here (opens new tab). Telephone Number: 0131 650 9225. To see more information on The Student Disability Service please click here (opens new tab). Telephone Number: 0131 650 6828. To see more information on Student Recruitment and Admissions please click here (opens new tab). Telephone Number: 0131 650 4360. Telephone Number: 0131 667 1971. Staff receive Disability Equality Training. You are on Site/Campus Car Park (Appleton Tower). Skip to the next section. 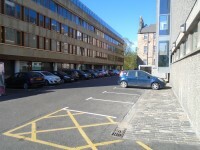 The car park is located to the left of Appleton Tower, accessed off Chapel Street. 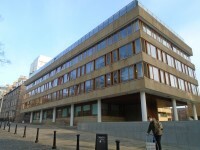 The nearest building(s) to this car park is/are Appleton Tower, 50 George Square. There is sloped access to the car park from the Chapel Street. This car park is not clearly signposted from the Appleton Tower Building. 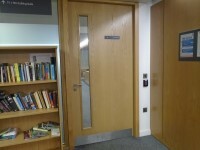 The nearest designated bay is 8m (8yd 2ft) from the Appleton Tower Building. Permits are not free and will need to be purchased from the University. 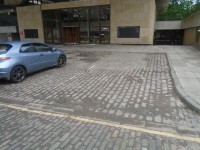 There are 2 Blue Badge parking bays adjacent Appleton Tower and a further 3 Blue Badge parking bays in the car park between Appleton Tower and 50 George Square. 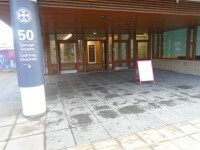 The Blue Badge parking bays are over 50m from the Bayes Centre. You are on Site/Campus Car Park (Windmill Lane). Skip to the next section. 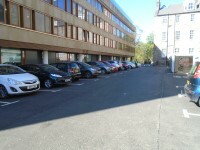 The car park is located to the rear of the David Hume Tower (DHT). 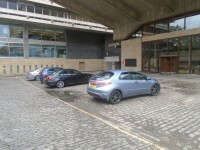 The nearest building(s) to this car park is/are the David Hume Tower (DHT). There is/are 1 designated Blue Badge parking bay(s) within this car park. 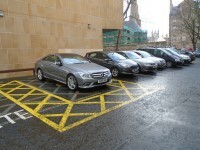 The dimensions of the designated parking bay(s) are 490cm x 630cm (16ft 1in x 20ft 8in). 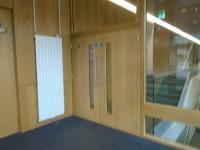 There is sloped access to the car park from the David Hume Tower (DHT) Learning Hub. This car park is not clearly signposted from the DHT Lower Ground Teaching Hub. The nearest designated bay is 14m (15yd 11in) from the David Hume Tower (DHT) Learning Hub Windmill Lane entrance. 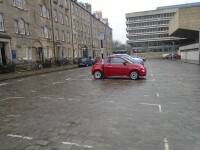 You are on Site/Campus Car Park (Buccleuch Place). Skip to the next section. 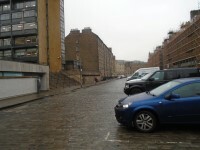 The car park is located on Buccleuch Place. 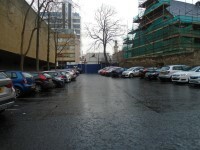 The nearest building(s) to this car park is/are the UOE Business School, Gordon Aikman Lecture Theatre and 17, 19-25, 30-34 Buccleuch Place. The car park surface is cobbled. 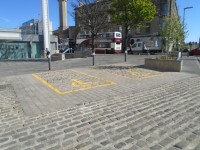 The dimensions of the designated parking bay(s) are 200cm x 500cm (6ft 7in x 16ft 5in). 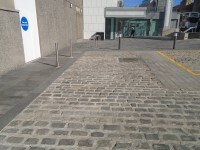 There is sloped access to the car park from the UOE Business School. This car park is not clearly signposted from the UOE Business School. The nearest designated bay is 10m (10yd 2ft) from the George Square Lecture Theatre Buccleuch Place entrance. 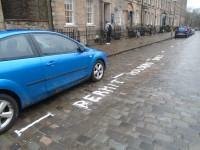 There is also permit holder and standard pay and display parking located along the length of Buccleuch Place. This information is for the entrance located off George Square. There is / are 5 step(s) to access the entrance. 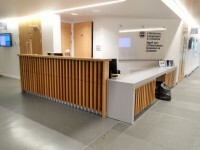 You are on Reception (50 George Square Reception). Skip to the next section. 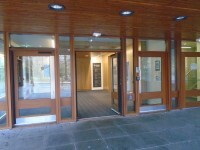 The 50 George Square Reception is located in front of you on entrance. Hearing loops are located in Lecture Theatre G.03, Screening Room G.04, G.01, G.02, G.05 & G.06. 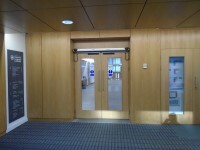 There are push pad automatic doors into postgraduate research 4.38 and the nearby refuge points on the fourth floor. The stairs are located to your left on entrance. 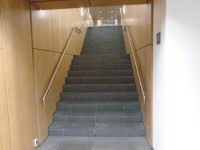 There are similar staircases in front of you and to the left when entering the building by the main entrance. They have single manual doors to enter and exit the stairwell on all floors except the fourth floor where they are push pad automatic. 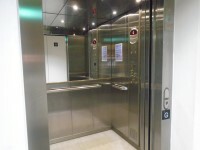 The lift is located to your right as you enter. 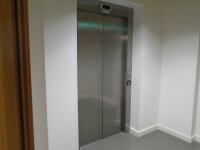 The dimensions of the lift are 146cm x 132cm (4ft 9in x 4ft 4in). 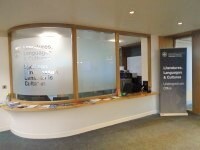 You are on Reception (Literatures, Languages & Cultures Undergraduate Office). Skip to the next section. The Literatures, Languages & Cultures Undergraduate Office is located in front of you on exiting the lift lobby on the first floor. The desk is 13m (14yd 8in) from the main lift. 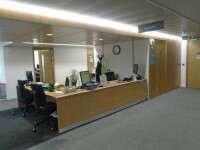 You are on Reception (Graduate Schools office). Skip to the next section. 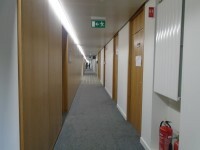 The Graduate Schools office Reception is located to the left of the stairs from the first floor to the second floor. The desk is 16m (17yd 1ft) from the lift. 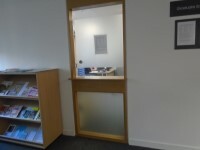 Clear signage for the reception area is not visible from the lift. 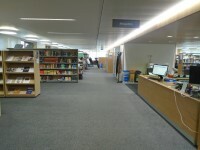 You are on Entrance (Study Resource Library 1.05). Skip to the next section. This information is for the entrance located to your right when you exit the lift lobby on the first floor. You are on Reception (Study Resource Library 1.05). Skip to the next section. Study Resource Library 1.05 Reception is located to your right on entrance to Study Resource Library 1.05. 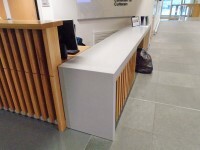 The desk is 5m (5yd 1ft) from the Study Resource Entrance. The desk is not staffed. If you require a video, DVD or Blue Ray you will need to ask for it at reception and it will be collected for you. You are on Library (Study Resource Library 1.05). Skip to the next section. There is not an ordering service. Large text keyboards and rollerball mice can be provided on requested. You are on Accessible Toilet (Left on Entrance). Skip to the next section. 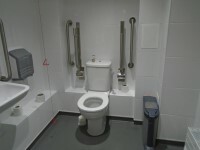 This accessible toilet is approximately 21m (22yd 2ft) from the main entrance. You are on Accessible Toilet (Accessible Toilet Rear). Skip to the next section. The accessible toilet is located at the rear of the building. 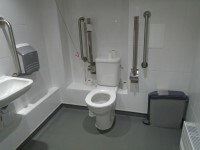 The dimensions of the accessible toilet are 225cm x 200cm (7ft 5in x 6ft 7in). There is a baby change at a height of 82cm in the toilet. 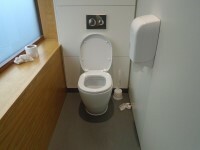 This accessible toilet is approximately 27m (29yd 1ft) from the main lift. 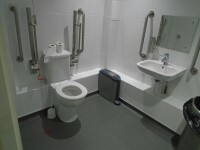 This accessible toilet is located to the left of the corridor on the first floor. 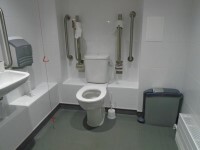 The dimensions of the accessible toilet are 178cm x 172cm (5ft 10in x 5ft 8in). 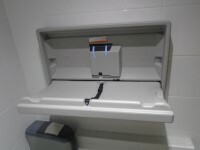 This accessible toilet is approximately 24m (26yd 9in) from the lift. 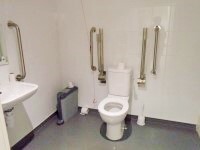 This accessible toilet is located to next to the standard toilets and showers. There is a similar toilet in the same location on the third floor. This has a baby change at a height of 96cm. There is also a similar toilet on the fourth floor. 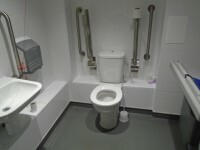 The dimensions of the accessible toilet are 175cm x 175cm (5ft 9in x 5ft 9in). You are on Accessible Toilet (Second Floor to the Right of the Lift Lobby). Skip to the next section. This accessible toilet is located to your right when you exit the lift lobby. There is a similar toilet on the third floor. 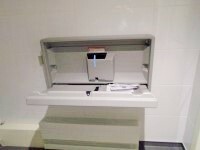 The dimensions of the accessible toilet are 220cm x 168cm (7ft 3in x 5ft 6in). 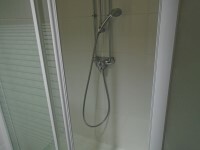 The shower(s) surveyed is/are located next to the male and female toilets on floors 2, 3 and 4. 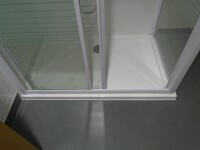 There is an easy step to access the shower as shown in photograph 2. 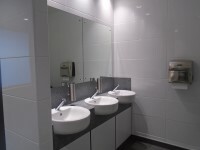 There are male and female standard toilets facilities on the ground floor, the first floor, the second floor, the third floor and the fourth floor. The toilet surveyed is located to your left as you enter. 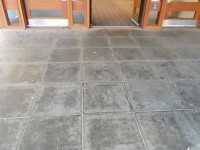 The standard toilet surveyed is approximately 21m from the main entrance.